Valentine's Day wordangle printable. 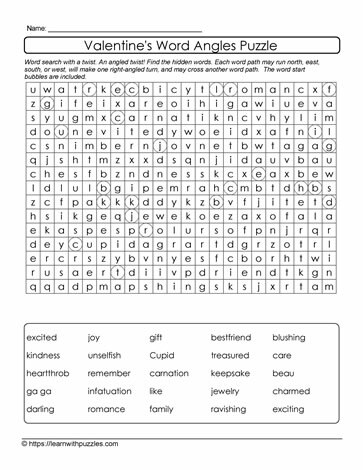 Here is a Valentine's Day wordsearch printable with a twist! Using start bubbles to locate words in the word bank highlight each word to complete the wordsearch puzzle. Because this is a wordsearch with a twist, remember to look for one right angle in each word in the grid. Hidden words can go horizontally, vertically, forwards and backwards. Puzzles support students' vocabulary building skills. They activate problem solving strategies in all classrooms: digital, regular, Google, and the home schooling environment. To support English language learners and struggling readers, use differentiated instruction to facilitate support. Puzzles complement language curricular in elementary 3,4,5 grade classrooms.